NASBA Chair Billy Atkinson, a BRP member, quickly summarized for the Panel the role of the State Boards of Accountancy, by way of explaining why they are interested in standard setting and what this new group may ultimately recommend. He emphasized that the Boards regulate over 650,000 CPAs. 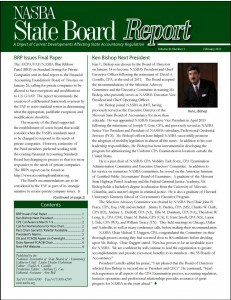 Judy O’Dell, chair of the FASB’s Private Company Financial Reporting Committee (PCFRC), told the BRP that on November 2, 2009 the PCRC wrote to the Financial Accounting Foundation asking them to take a leading role in ensuring the establishment of private company standards. She said the PCFRC is calling for “rethinking, not bashing, the current process.” Ms. O’Dell said the PCRC has been following what other countries are doing: Canada has set its own private company standards; Japan is involved in a similar research project; and some have adopted International Financial Reporting Standards (IFRS) for Small and Medium Entities or rejected them. A representative from Canada is scheduled to address the May 14 meeting of BRP to update them on how their new standards are being implemented. Paul Beswick, Deputy Chief Accountant in the office of the SEC’s Chief Accountant, cautioned that the BRP should not try to forecast what the SEC is going to do about adoption of IFRS. He advised the panel to “focus on private companies.” He noted that Canada has decided to maintain its national standard setter for private companies. No new research was called for at the first meeting of the BRP. Five years ago the AICPA issued its Private Company Financial Reporting Task Force’s Report, which included the findings from a random survey of over 1,000 people and of an outreach survey of over 2,700 people. James G. Castellano, who chaired that Task Force, reviewed its findings with the BRP. While the study found all groups of constituents rated certain attributes of GAAP as being high value, some GAAP concepts were found to have low relevance and decision usefulness for private companies, Mr. Castellano said. The Task Force had concluded GAAP standard setting needs to be different for private companies. In response, the FASB created the committee headed by Ms. O’Dell. Professor Teri Yohn told the BRP that the American Accounting Association had commented that the AICPA Task Force’s survey over?represented practitioners, not including enough representation of users. Mr. Atkinson asked if a new survey five years later would be helpful and Mr. Castellano replied that the topic had been researched for decades, but it was up to the BRP to determine if more is needed. An argument often posed for a single set of standards is that private companies can more easily transition into being public companies with a single set of standards, but Mr. Anderson said most companies that decide to go public discover they need to make restatements to get into compliance with the SEC’s requirements for public companies. Mr. Beswick said he would put together information on the number of restatements companies had to make in their initial public offering process, as well as other financial reporting challenges they encountered. The SEC will also prepare information on companies that are not necessarily SEC registrants, but who need to prepare GAAP financial statements, such as those private companies that are equity method investees in a public company.